Escape to the Romantic Sonoma Coast! For a romantic winter getaway, you may not immediately think of the Sonoma Coast, but it’s actually a secret treasure to be explored. The thundering crash of the waves. The velvet gray clouds, sparked with brilliant shards of gold as the sun streams through. Oh, the invigorating nip of the air, fragrant with sea salt – it all inspires cuddling, and stolen time with your sweetie. The Sonoma Coast is magical in the colder months, and beckons with seasonal activities like exhilarating seaside hikes, and amenities like lower prices on beautiful lodges and inns. Keep in mind, too, during the winter, this stretch of the Northern California coast is often very mild and temperate – surprisingly sunny and warm even when more inland areas might be chilly. Indulge with The Spa Gourmet: Husband-and-wife team Cindy Scott-Fuchs and Trip Fuchs take spa style on the road. First, they coordinate a location, such as a private, luxury rental home on Doran Beach overlooking the ocean. Then they set up a complete spa on-site – often favoring outdoor settings like a mountainside meadow or oceanfront plateau. Cindy customizes treatments, like Thai massage with hot stone therapy, warm foot wrap, and a mini facial of lavender infused steam, herbal cleanser, Indian clay mask and coconut oil massage. Next, Trip, a private chef, cooks a feast, ranging from hors d’oeuvres to a full supper. It’s pure relaxation as the couples or small to mid-size groups then enjoy a night in their vacation home, with breakfast the next morning. Bodega Bay brims with beautiful art salons and shops, from local talent capturing the dramatic landscapes in paint, sculpture, glass, and even whimsical kites. Stop in the shops in the tiny town of Bodega on your way to the coast, and then again in the central town by the Bay, and browse to your heart’s content for everything from early California impressionistic portraits, to photography, to turned wood, and frothy, colorful scarves. Bond over the beauty of the easy Bodega Head hiking trail that edges 3 miles around the headlands, or a 1-mile path to-and-from the overlook. You’ll be rewarded with spectacular views of the Pacific Ocean, Bodega Harbor, and the town itself. 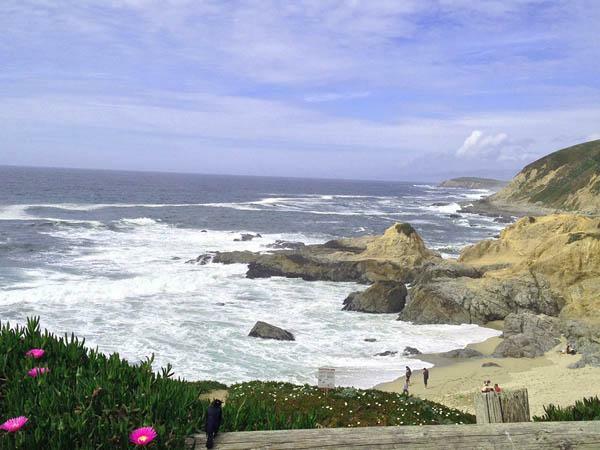 To get there: Take coastal Highway 1, just past the town of Bodega Bay. Turn left on Eastshore Rd., then right on Bay Flat Road. Go around the harbor and turn right at Campbell Cove, then head uphill, bearing right at the fork for the free parking lot by the cliff. Doran Beach Regional Park is another stunning spot, boasting a two-mile stretch of sandy beach that’s quiet, secluded, and dog friendly (leashed, please, for the abundant wildlife). Protected by the bay, the water is calm, perfect for dipping toes, and there’s a rock jetty at the harbor mouth for fishing and crabbing under gentle wind-scudded clouds dancing across the sky. Bring your picnic basket, your camping gear, and even your boat. You’ll also adore Goat Rock, a highlight of spectacular Jenner just north of Bodega Bay. As one of the most easily accessible sandy beaches tucked amid the towering bluffs and crashing waves, the partial cove is also a superb area for wildlife watching, where the Russian River meets the sea. Hike the trails around the high surrounding cliffs to watch migrating gray whales, or claim a prime perch on the beach, which is home to a colony of frolicking harbor seals. The Tides Wharf was made famous in the early 1960’s as the backdrop for scenes of Alfred Hitchcock’s film classic, “The Birds.” But locals flock to the Bodega Bay-front restaurant tucked in the lovely Inn at the Tides resort for its delicious seafood, like shrimp, oysters, calamari, salmon and Pacific red snapper. Just one specialty is crab cioppino, stocked with prawns, scallops, clams and mussels, too, in a zesty Italian sauce with garlic bread for dunking. You can toast your sweetie, as well, since the hotel’s adjacent Bay View Restaurant also tempts with winemaker dinners once a month January through June – the next one is Feb. 26 with the exclusive Kosta Browne and Trecini teams. The Duck Club in Bodega Bay is ultra local, as well, offering crab cakes slathered in tomato-ginger chutney, and pesto-crusted Bodega Bay salmon. For hidden gems, meanwhile, Terrapin Creek Café in Bodega Bay offers artfully arranged cold crab salad with the seafood plucked straight from the sea outside, while the new Black Point Grill in Sea Ranch wows with Sonoma duck tacos topped in queso fresco, cabbage and sweet lime vinaigrette, or roasted Northern halibut with warm pineapple salsa and crisp parsnips. Enjoy a luxury room at the Inn at the Tides, or another favorite hideaway is the Bodega Bay Lodge, so romantic and serene on its seaside perch. As the only AAA Four Diamond hotel on the Sonoma Coast, it offers a luxury escape, in rooms outfitted with real fireplaces, warm, snuggly down comforters, and private balconies for stargazing. And sign up for couple’s massage, with spa suites overlooking the Pacific Ocean and Sonoma coastline, offering a signature warm shell massage with tiger clam seashells. You’ll also love Timber Cove Inn of Jenner. Sure, the drive is an exhilarating one, hugging Highway 1 on the edge of the cliffs soaring above the crashing waves and jagged rocks of the Sonoma Coast. But just a bit north of Fort Ross and Jenner awaits a miniature town with a very big reason to visit: this secluded inn and its Alexander’s restaurant. Recently renovated for a more modern lodge mood, the inn offers rooms with ocean or forest view rooms, private spa tubs, fireplaces, skylights, and the drama of ancient wood trim against crisp white bedding. The restaurant is celebrated for its rustic luxury charm and extraordinary ocean views from floor-to-ceiling windows in the dining room – indeed, guests travel from all over for a spectacular cliffside meal, relaxing before a roaring fire in the huge stone fireplace in the Sequoia Lounge, then taking a brisk, post-dinner stroll in the crisp Pacific air. River’s End Restaurant & Inn showcases Jenner’s amazing beauty, as well, particularly at sunset. What a delicious combination: breathtaking views and mouthwatering Cal-cuisine at this locals favorite restaurant perched on a bluff overlooking the mouth of the Russian River where it enters the Pacific Ocean. It’s a hidden favorite, and during the migrating season, people in the know flock here for watching seals and whales on their annual journey. The menu is enticingly eclectic, ranging from wasabi tobiko-topped oysters to Petaluma duck confit egg rolls, sea bass with pomegranates and beets, and applewood smoked filet mignon slathered in Pt. Reyes bleu cheese. Get Your Heart Pounding with Bodega Bay’s NorCal Sports Fishing: Many Sonoma County stores sell fish so fresh it may have been swimming that morning. For even fresher, you can buy right off the boat, at the Bodega Bay marina. Still, for the freshest of the fresh, charter boats go out onto the great blue, hunting for rock cod, 25-pound-plus salmon, albacore, halibut, and even Humboldt giant squid. And you can be part of the crew, taking breaks between smooching with your sweetie to reel in your catch. Save your queasiness for the sometimes pounding waves, by the way – the crew will kill, clean and bag your fish for easy cooking. Because what’s more romantic than a meal you’ve lovingly prepared for your special someone?